New Zealand’s Minister for Primary Industries, Nathan Guy, recently described the country as a nation of over 4 million that feeds around 40 million, with agriculture, forestry and fishing (excluding mining) adding approximately $7.85 billion to our annual gross domestic product (GDP). Accounting for approximately 3% of the country’s population, New Zealand’s farm owners and workers also contribute to our GDP via their own shopping habits. Some of these habits are quite specific, with Roy Morgan Research finding, among other things, that farm owners and workers are 33% more likely than the average Kiwi to make a purchase at Mitre 10 in any given four-week period. They are also logically far more likely to purchase from specialist stores such as agricultural supplier PGG Wrightson and rural retailer RD1. The message from Roy Morgan Research, though, is that specialist agri-retailers should know their customers and target their marketing dollars accordingly. We asked Pip Elliott, General Manager, Roy Morgan New Zealand, just what it is that agri retailers should be thinking about when it comes to retaining and attracting customers. Q: What are some essential pieces of information that business owners need to know about their current (and desired) clients? Q: How important is technological adaptability in a niche area such as agricultural retail? 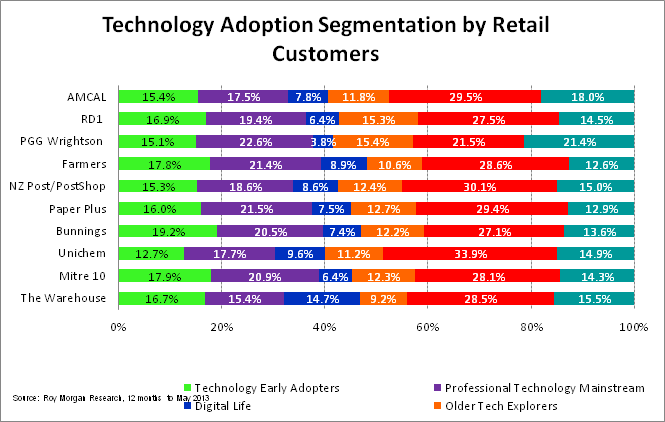 “If you refer to the above chart, you’ll see that total customers for each of the ten stores mentioned vary significantly in terms of their levels of technology adoption,” says Pip. “Knowing this kind of information about their market is invaluable for retailers – niche or general – as it allows them to decide which would be the most effective medium for reaching the largest amount of clients. 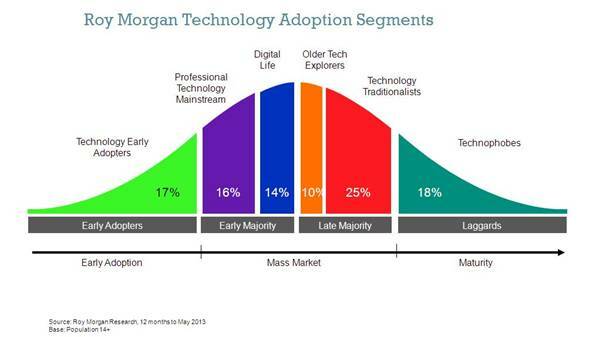 A large DIY Retailer like Bunnings tends to attract a higher proportion of ‘Technology Early Adopters’ than the more niche stores, which would influence the way they communicate with their customers and possibly explains how well-developed their website is. Early adopters tend to enjoy tinkering with gadgets and gizmos in general, so it’s no surprise they’d shop somewhere like Bunnings more than a niche retailer like Unichem for example.